3 Bedrooms, 3.5 baths- Sleeps 8-10 Persons- Private pool The White House is a modern custom built two-story, three bedroom, three and one half bath home perfect for families or couples who require affordability, lots of space and privacy everyone can enjoy. It is conveniently located in the very lovely gated community of Playacar phase 2. With a spacious open floor plan design all living areas of this vacation home easily accommodate eight to ten persons. There are a total of three master bedroom suites; two with king size beds and a balcony or terrace and one with two queen beds, each offering open or walk-in closets, private bathrooms with shower and plenty of room for all. The spacious dining area and kitchen is fully stocked with all the necessary appliances such as refrigerator, stove with oven, utensils, microwave, coffeemaker, blender, toaster and drinkable water; seating eight. The family room has a 55´ satellite flat screen TV, WI-Fi and comfy sectional sofa great for entertaining or watching a movie comfortably with a scenic view of the pool and outdoor lounge area. The private pool area has five lounge chairs and a shallow pool area for the kids to play, private off- street parking. When you are not swimming in the White House private pool, you may use the complimentary tennis courts as part of the gated community or simply take an evening stroll among ancient Mayan ruins just a few blocks away. Golf lovers will find the Playacar Golf & Spa club as well as a small shopping plaza with our neighborhood Starbucks within close walking distance. There are numerous activities to do, exciting new sites and beaches to explore in and around our White House, Playa del Carmen. We believe that this home is the perfect vacation rental option for a large family or group of friends. Everybody is awesome, cleaning, maintenance and reservations staff! and the Concierge Salvador gives great service, he knows the best places to visit around the Riviera Maya. Thank you all! We have rented places in Placacar in the past and this was quite enjoyable and if the house was available for the same price and time next year, I would book it again with no question asked and would feel that Vimex would take care of us with the piece of mind we are looking for. Deposits: We ask for a 50% of the rental price to reserve your rental unit, then the other 50% should be paid one month prior to your arrival. If you are arriving in less than 30 days at the time of booking, we require the full payment of the rental home price. Cancellations and refunds: If cancelled 60 days prior to arrival, you will get a 100% refund (minus $150 USD handling fee). If cancelled 30 days prior to arrival, you get a 50% refund (minus $150 USD handling fee). No refunds will be given for cancellations within 30 days of arrival. Other: Smoking is not allowed inside any of the rental properties. Please take the time to read the complete rental agreement and contact us should you have additional questions. Playacar is a residential and tourist development in Playa del Carmen, just south of the main urban area. 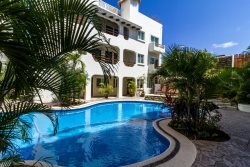 In this private development where most of the exclusive all-inclusive hotels such as the Riu, Sandos Playacar, Iberostar and The Reef Playacar reside, just to mention a few.